Nigerian Maritime Administration and Safety Agency (NIMASA) has commended the recent approval given by the Federal Executive Council (FEC) for the establishment of the Nigeria Maritime University (NMU) to commence academic activities. The university is an initiative of the Nigerian Maritime Administration and Safety Agency (NIMASA). The institution, which received FEC approval at its meeting in Abuja, Wednesday, as announced by the Hon. Minister of Information, Mrs Patricia Akwashiki, is the first full-fledged maritime university in West Africa. With its permanent site in Okerenkoko, Warri South-West Local Government Area of Delta State, the university is expected to run courses in Marine Engineering, Naval Architecture, Nautical Science, Transport Technology and other maritime related professional areas at degree and sub degree level. Speaking on the approval, the Director General of NIMASA, Dr. Ziakede Patrick Akpobolokemi said “this formal approval of the licence will signify a major milestone in the Agency’s capacity building initiatives as it will guarantee sustainable training of qualified manpower for the maritime industry at international standard”. Following the licence issued by the Federal Government, the university is now set to commence academic activities at its fully developed temporary site in Kurutie, also in Warri-South West Local Government Area. The groundbreaking ceremony of the institution, as well as that of the NIMASA Shipyard and Dockyard in Okerenkoko, was conducted by President Goodluck Ebele Jonathan in May, last year. 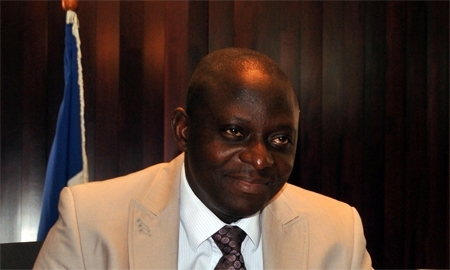 The NIMASA management, led by the Director General, Dr. Ziakede Patrick Akpobolokemi, has remained committed and focused in building human capacity for the Nigerian maritime sector through strengthening the Nigerian Seafarers Development Programme (NSDP), a scholarship programme designed to train young Nigerians in various maritime professions at degree level. NSDP has over 2,500 beneficiaries in academic institutions in Egypt, India, Philippines, Romania and the United Kingdom; a number of whom have since graduated. The Akpobolokemi administration has also established Institutes of Maritime Studies in six Nigerian universities, including University of Lagos, University of Nigeria Nsukka, Ibrahim Badamasi Babangida University, Lapai Niger State, Niger Delta University Amasoma, Bayelsa State, Anambra State University Uli and Federal University Kashere, Gombe State.